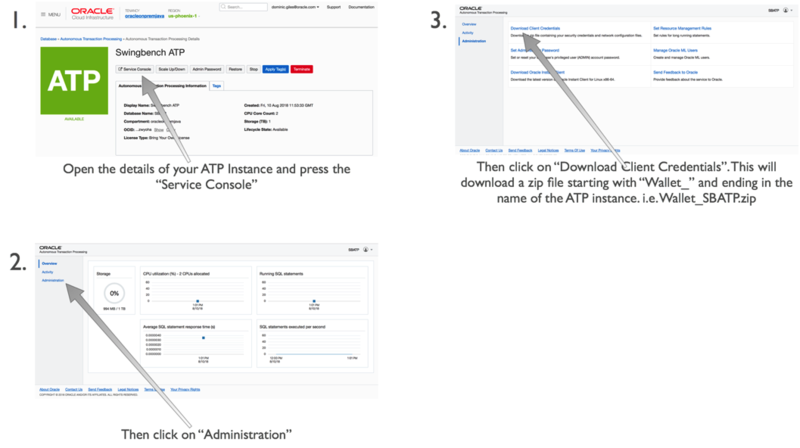 The following blog details how to install swingbench against ATP and use it to run load tests. The example below used the Simple Order Entry (SOE) benchmark but its possible to follow the methodology laid out below to run any of the other supplied benchmarks (SH, TPC-DS etc). To do this you’ll need to run through the following steps (Step 8 is optional). You’ll have to have gone through the process of acquiring an Oracle Cloud account but that’s beyond the scope of this walkthrough. 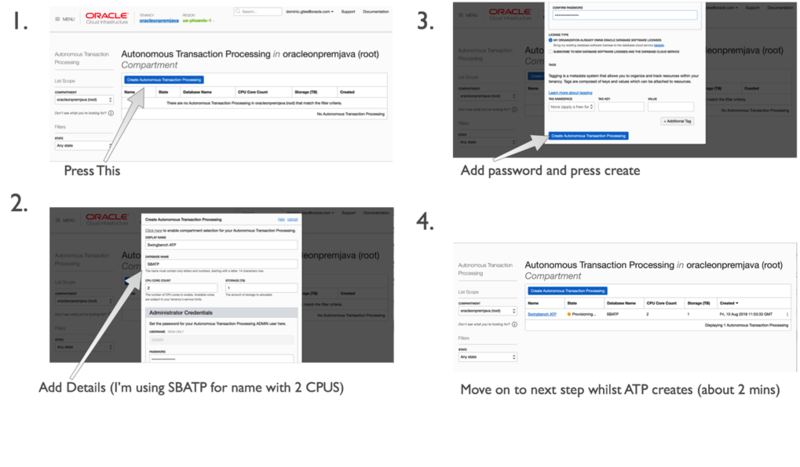 Once you have the account and have logged into Oracle Cloud Infrastructure, click on the menu button in the top left of the screen and select “Autonomous Transaction Processing”. 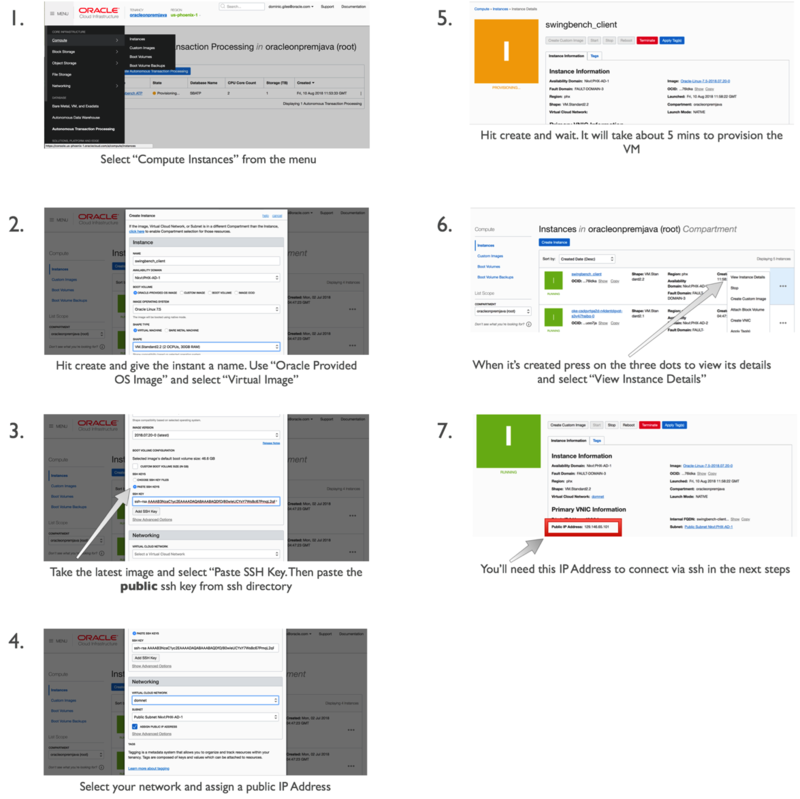 Then simply follow these steps. Whilst the ATP instance is creating we can create our application to run swingbench. For any reasonable load to be run against the application server you’ll need a minimum of two cores for larger workloads you may need a bigger application or potentially a small cluster of them. In this step we’ll use ssh to log onto the application server and setup the environment to run swingbench. Ssh is natively available on MacOS and Linux. On platforms like Windows you can use Putty. You’ll need the IP address of the application server you created in the previous step. This will placehe home directory of the application server. You don’t need to unzip it to use it. And then running the following command replacing your passwords with those that you specified during the creation of the ATP instance. You should see the following output. A scale of 1 should take just over 5 mins to create. If you specified more CPUs for the application server of ATP instance you should see some improvements in performance, but this is unlikely to truly linear because of the nature of the code. The first thing we need to do is to configure the load generator to load the users on in a sensible fashion (i.e. to not exceed the login rate). You could do this manually by editing the config file or use the following command. •	-v indicates what info should be shown in the terminal when running the command. In this instance I’ve asked that the users logged on, Tx/Min, Tx/Sec and the average response time for each transaction are shown. •	-intermin -intermax indicates the time to sleep between each transaction. •	-di indicates that I want to disable the following transactions SQ,WQ,WA. These are reporting queries and aren’t really needed. Which would run the benchmark for 1 hour 30mins. or you could leave the -rt command off altogether and the benchmark would run until you hit return. One thing to try whilst running the load against the server is to try and scale the number of available CPUs to the ATP instance up and down. This should see an increase in the number of transactions being processed. Using the methods above you should be able to create scripts that test the performance of the ATP server. i.e. running loads with different CPU counts, users, think times etc. The -cf parameter references the credential file you downloaded and the -cs parameter references the service for ATP. You should see a scree similar to this. You can use this to monitor in real time the activity of the ATP instance. Currently it reports all of the cores on the server you are running on. This will be fixed shortly to just show the cores available to you. That's it. We’ve installed swingbench against Oracle Autonomous Transaction Processing. In my next blog entry we'll take a look at some automated tests you can user to kick the tyres on ATP. I'll also include a version that shows how to install the TPC-DS like schema that comes with swingbench against Oracle Autonomous Warehouse.